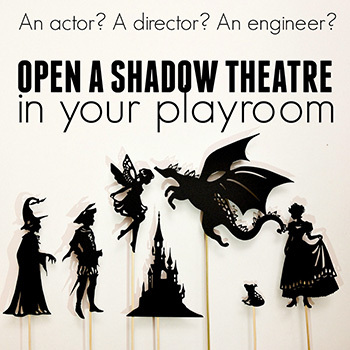 They can pour it, mix it or even climb inside of their soup bins and wiggle bare toes around! 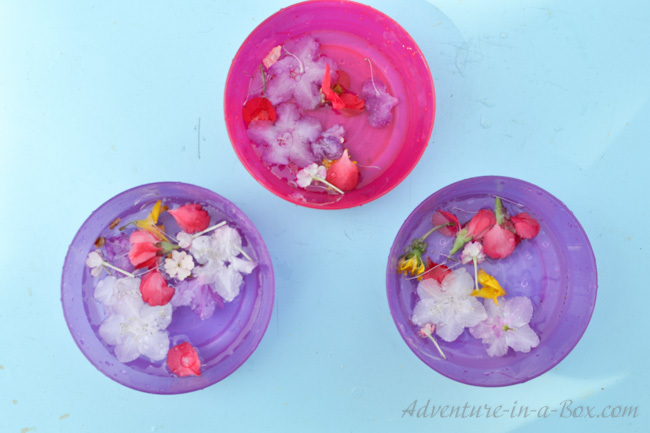 A delightful spring activity for toddlers that addresses all the different senses. I never remember being so exuberantly happy over the coming of warm weather when I was a kid. Yet these days I coo over the first dandelions and celebrate blooming trees, filling our spring and summer with little festivities. Last week, it was magnolia trees, and this week lilac bushes are in bloom. When the trees are done blooming, there are a lot of petals and blossoms on the ground, which are beautiful in their own right. Standing by a majestic purple rhododendron bush that had already lost half of its flowers, I wondered if we could do anything with them. 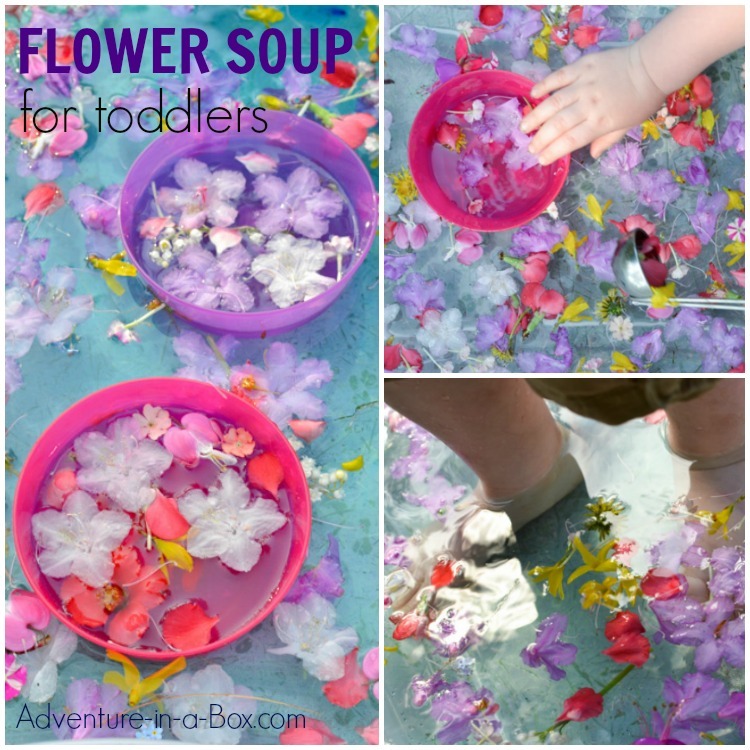 Maybe a little flower sensory bin? When Budster was smaller, I usually made a new toy for him by myself and presented it to him as a surprise. There was definitely a certain appeal to it since we all like surprises, but recently Budster has been helping me with preparations, and it is half the fun for him. So, first of all, we went on a flower hunt around the yard and down the street. Our neighbours who let Budster run around free in their yard have a particularly wonderful selection of blooming bushes this time of a year. 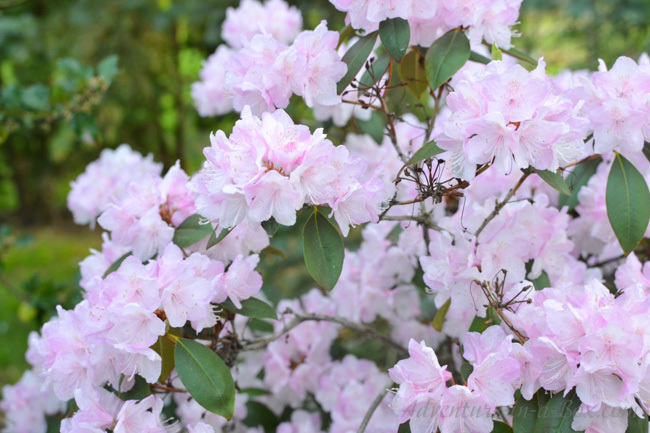 We admired them and sniffed them, picking a couple of flowers off the bush, usually the fallen ones. Our forsythia was losing blossoms rapidly, and it was a start of our collection. We got different shades of rhododendron flowers and added red quince petals, then picked a couple of dandelions. There were also flowers I couldn’t name, but we put them into our basket all the same and carried them back to our yard. 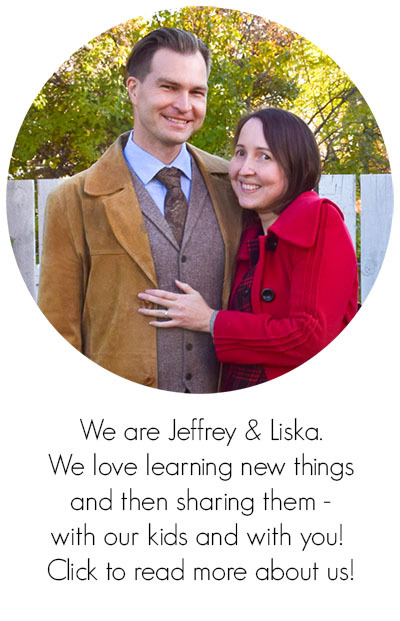 We emptied the basket into a little plastic tub. “Do you want to make some flower soup?” I asked Budster. He was as enthusiastic as when we make a chocolate cake. 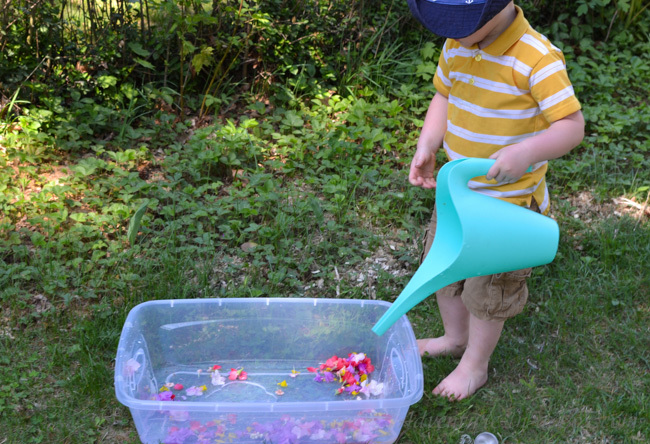 We filled his watering can with water, which he then poured over the flowers. 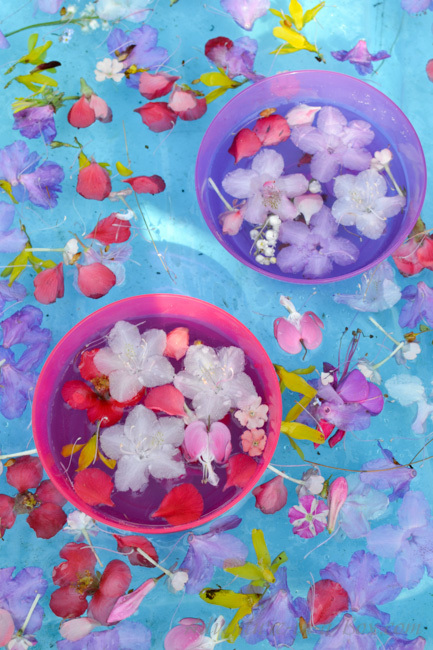 Seeing the flowers floating in the water, Budster anxiously requested “a scoop”. I brought him a couple of different ladles and bowls, and he happily set to work, filling them with flowers. 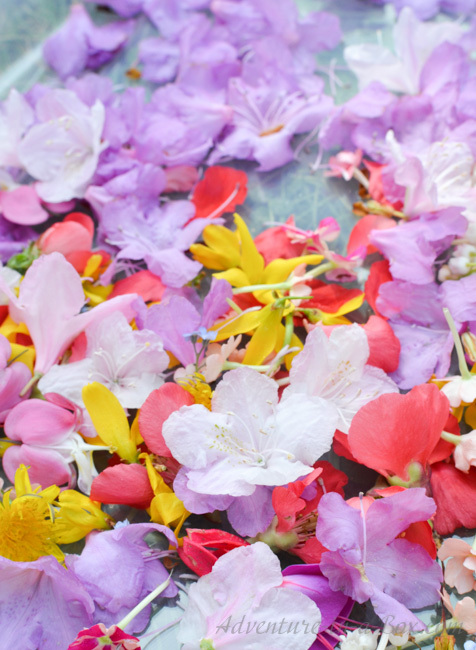 Here is my little confession: while my son was working on his flower soup, I was sitting right by the bin, stroking the flowers in the water. It was very relaxing. The day was getting hot, and having the cool water whirl around my fingers felt wonderful. 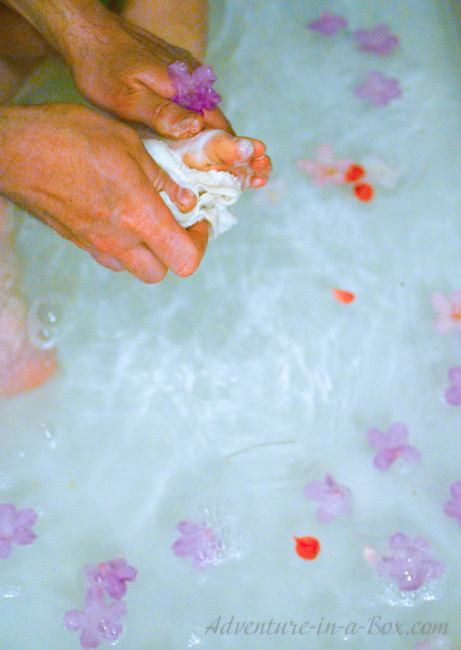 I mentioned to my husband that I always wanted to take a petal bath. 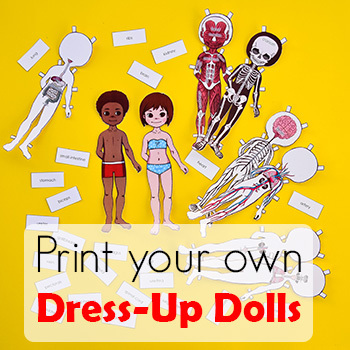 If only I was 18 inches tall! I would have fit in that bin. 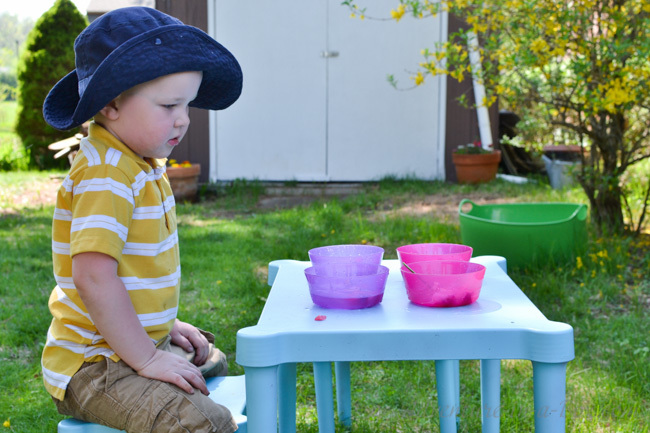 After filling the bowls, Budster lined them up on his little outdoor table and invited me to have lunch together. And what a delightful lunch it was! If not for the stomach, flower soup was very good food for the eyes and nose. After Budster served enough soup to invite the whole block over for a party, I suggested, “Do you want to step inside the tub?” Oh, he liked that idea. Flower puddle! 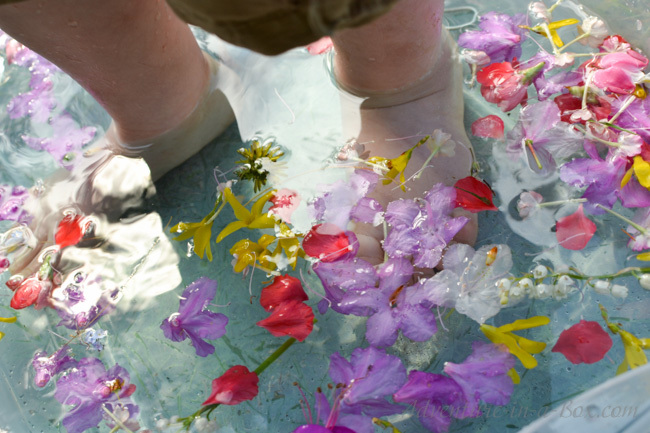 His shoes got immediately wet, but I managed to take them off eventually, so that he could have a good toe wiggle in the company of flowers. I couldn’t help but try it too after Budster came out. Mmm! It felt good. 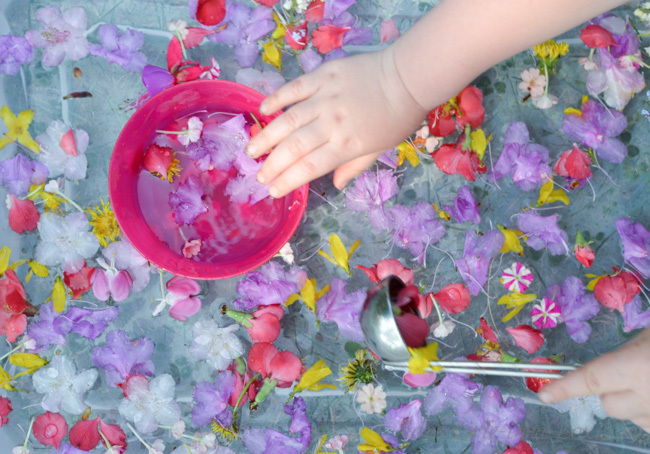 Given a chance, I would add fairies and butterflies to our sensory bin. But it was Budster’s bin, so in due time it turned into a truck-hauling-flowers playground. 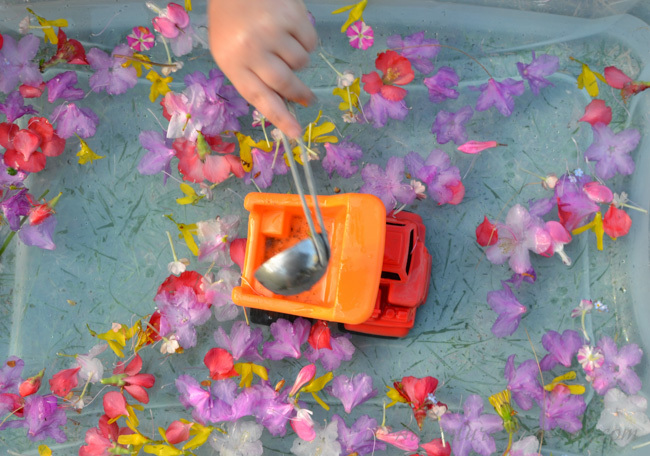 And as I noticed recently, where there is water in our backyard, sand is soon to follow, so from flower soup we proceeded to making flower mudpies… Our flower bin definitely had its share of magical transformations that afternoon! The last, but not least happened a few hours later. I strained the blosoms into a bowl, and when Budster was taking the bath that evening, threw them in the water. Here is Daddy, scrubbing Budster’s little foot in a bath full of flowers! 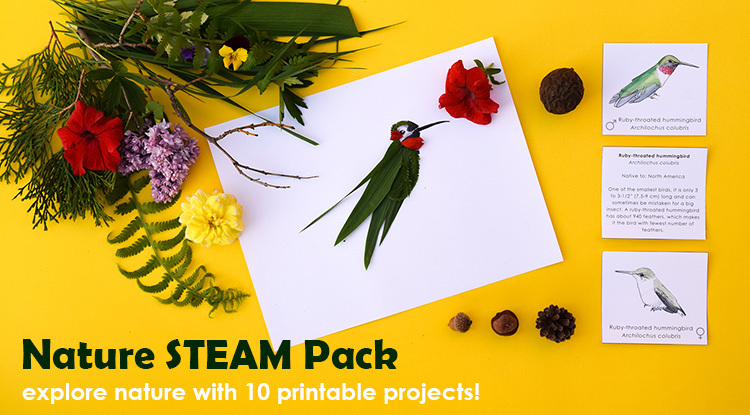 Have some nature fun with our nature STEAM bundle! 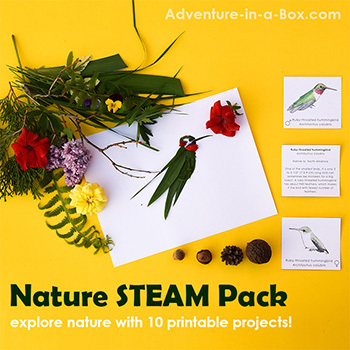 Children will learn about nature while playing games, completing engineering challenges, going on scavenger hunts, and making art with natural materials.